The future-proof behemoth features TWO of NVIDIA’s flagship GPUs in SLI* – each with 11GB of ultra-fast GDDR6 memory over an NVLINK™ bridge. The evolution of gaming realism is here. The revolutionary NVIDIA Turing™ architecture fuses together real-time ray tracing, artificial intelligence, and programmable shading to give you a whole new way to experience games. Ray tracing is the definitive solution for lifelike lighting, reflections, and shadows, offering a level of realism far beyond what’s possible using traditional rendering techniques. 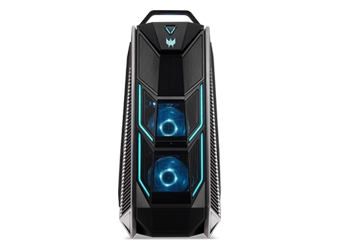 Intel®’s overclockable i9-9980XE Extreme Edition processor opens the door to monolithic multi-tasking with up to 18 cores and 36 threads. So to those who create, game, stream and dream – do it all from one place with the Orion 9000. One example of how X-series processors adapt to your needs is with Intel®’s Turbo Boost Max Technology 3.0 – which identifies critical workloads and directs the two fastest cores to deal with them. Support for 4K visuals, quad-channel DDR4 2666 RAM and Intel® Advanced Vector Extensions 512 (Intel® AVX-512) is just a taste of what’s possible with X-Series processors. What’s better than a PCI express SSD? Two M.2 PCIe SSDs* (up to 512GB), using NVMe technology, in RAID 0. AKA – ridiculously fast drives. Don’t blink. You’ll miss the boot up. With eight* DIMM slots to play around with, why not slot in up to 128GB* of quad-channel* DDR4 2666* RAM? With this much memory, you can finally make extreme multi-tasking the norm. Add a bit of speed to your boot up, game loading or give an HDD that SSD-like kick with up to 32GB* of Intel® Optane™ memory. Caching’s never felt so good. This airflow management technology utilizes case design by separating the thermal zones in order to maximize cooling where most needed. There are four thermal zones. The PSU zone is self-contained while the GPU, CPU and storage zones split the cool intake air through both sides of the case. With the extreme processor the Orion has under the hood, coupling it with an AIO (All-in-One) Cooler Master® CPU Liquid Cooler* is the perfect fit. Heat never stood a chance. Up to five* RGB 120mm fans are strategically placed throughout the case to guide airflow through the system. Enhance and empower what you hear with some incredible tools from Sound BlasterX®’s Pro Gaming audio engine. Goodbye mediocre, hello marvelous! Scout Mode is a tool designed to help you hear beyond what you see by contrasting specific sounds so you can detect and react to the slightest movement. Every room is unique – which makes Automatic Room Calibration all the more necessary. Adapt your speakers to your room to optimize your audio. Professionally tuned by acoustic engineers with the aid of pro-gamers, the customizable audio profiles create a unique and optimal sound experience. PredatorSense™ is the ultimate tool for control. Take command over lighting, overclocking, game profiles and more. Try not to get lost amidst all the settings. Virtual reality. It’s everywhere, constantly improving and beyond enjoyable. This machine is ready and able, so go ahead and jump on in.